This Crispy Pork is Chinese style. Some family is best served with stir-fried pak choi, but my daughter don't like much vegetable, then I decided to made this Crispy Pork with rice for my little girl. Thais like for breakfast eating till all day dining also. Pour water in a pot, bring to boil on medium-high heat, add cleaned streaky pork, season with salt and 1 Tbsp thin soy sauce, reduce heat to low and simmer for 1 hour until the pork is tender. Pierce pork skin with folk all over the strip, pat dry, and cut along the strip in half. Mix thin soy sauce, 2 Tbsp seasoning soy sauce, and sugar in a mixing bowl, add boiled pork strips, stir well, and marinate for 1 hour. Preheat oven at 325˚F. Bring marinated pork strips on rack and let both side dry well. Bake the strips for 30 minutes. Heat oil in a wok on medium-low heat. When oil is hot, add baked pork strips, deep fry until both sides are crispy, remove from heat and drain well. 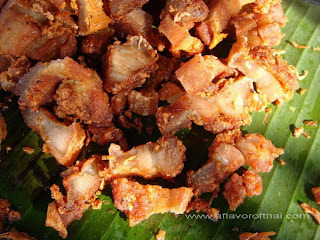 Cut crispy pork into pieces serve with hot steamed rice. set aside with sliced cucumber, green onion, boiled egg.